School buses – for a wedding!? School buses aren’t just for school kids anymore! Believe it or not, they can actually make a great substitute for the typical wedding transportation options. Not only are buses often priced lower than limos, they can offer a more comfortable and less cramped accommodations, and make a great choice for a variety of different needs. Looking for an easy way to help your guests move between venues? Whether the problem is a lack of available parking, planning for guests from out of town, or making sure Aunt Cindy stays safe after a few glasses of wine at cocktail hour, school buses can offer the perfect solution. They’re big enough to provide rides to a large number of guests at once, and you’re able to choose the size of bus based on your guest count. Plus, you can even opt for a wheel chair accessible one to accommodate your guests. Providing transportation for the wedding party can become a stressful task once you realize how many people need to be included, and how much a limo can cost! Renting a school bus for this job makes perfect sense… There is more than enough room for everyone, and there’s no need to worry about cramming everyone into a too-tight limo. With room to fit everyone, there’s no worries about ruining hair or crinkling dresses because everyone had to squeeze together to fit in! With Switzer-CARTY, you can trust that the same drivers that transport kids to and from school every day will take the same care of your wedding party guests. 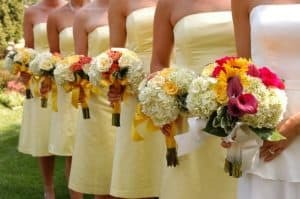 We serve brides & grooms and wedding planners across Ontario to take care of your best friends and family! More than school buses, check out our luxury micro and limo coach party buses, too! Heading out for some drinks before or after the reception? Use a school bus as your party bus! Who wouldn’t enjoy partying the night away in a throw back to their school days? enjoy partying the night away in a throw back to their school days? Whether you choose to have it run on a schedule throughout the night, or on an as-needed basis, there’s no need to worry about your guests driving them home safely when you have a school bus at the ready! From 12- 48 passengers, including ones that are wheel chair accessible, a school bus can be the perfect fit for your group. And since a driver is provided with your rental, you know you’ll make it home safely. After the party has wound down, your guests will be looking for a safe and easy way to get home. Providing a small bus to get them there will no doubt get them talking, and get everyone home safely. Whether you choose to have it run on a schedule throughout the night, or on an as-needed basis, there’s no need to worry about your guests driving them home safely when you have a school bus at the ready! Is your wedding out of town, or at a location that doesn’t offer much in the way of parking? Choose a central location for your guests to park, and drive them to the wedding site in a school bus! A driver is provided, so you know your guests are safe, and there’s no worries about making sure everyone gets there easily and on time. Book a School Bus for a Wedding to Save. All Aboard! A school bus may seem like an out of the box idea at first, but when you think about it they’re actually an affordable solution for many potential concerns on your wedding day – and super fun! Consider renting for wedding, and help relieve some of your stress before it starts!